You give a great sermon only to hear, Someday you'll be a good preacher. (ouch!) You can respond by setting your heels and continuing to do what is comfortable, or you can learn from your professional superiors, and yes, even from your strongest critics. Becoming a good preacher is like traveling a winding mountain highway, where you are constantly surprised and sometimes terrified by new vistas and perspectives. But in the words of Willie Nelson, you have to be willing to get on the road again, because it's a road worth traveling. The future of the church depends on good preaching, because faith comes from hearing the message, and the message is heard through the word of Christ. (Romans 10:17) But becoming a good preacher is a most complex task. 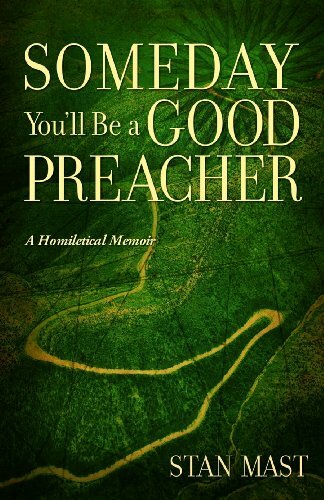 Someday You ll Be a Good Preacher follows the long and often painful journey of one working preacher as he developed from a cocky seminarian to a seasoned veteran of the pulpit wars. On his journey up that winding mountain highway, Mast encountered many of the big issues in preaching: balancing theological clarity with personal relevance, interpreting Scripture in a changing culture, coming to absolute clarity on both sermon theme and purpose, shaping sermons to appeal to both left and right brain listeners, insuring that every sermon centers on Christ in a graceful way, preaching with passion in the power of the Holy Spirit, and listening to your spouse and others close to your heart. This is not a how to book, but a narrative that describes the journey of one working preacher and the lessons he's learned. Designed for those preachers who are on the road to good preaching (and for those congregants who wish the journey wasn t so long and slow), it aims to encourage seminarians and those in their first churches. Hoping to prepare growing preachers for those ego-deflating, but ultimately uplifting experiences of devastating criticism that will come every preacher s way, Mast shares his story so that those experiences will produce growth rather than death in a young preacher. It may also enable some old pros to relive their journey and finally thank God for those awkward, disappointing, sometimes excruciatingly painful moments, when someone suggested that they were not quite the preacher they could be. At bottom, this little book wants to help preachers not only to love their supporters, but also to learn from their critics. Mast says, I hope that those critics will realize how powerful their words can be for good and for ill. I have learned much from my critics. That doesn t mean I always liked them. With words I never wanted to hear, they moved me from my supposed present excellence to another leg of the journey to good preaching. Spend some time learning the utter importance of continuing your journey, even when the goal seems elusive. It's a long road that may not always go the direction you think it should. But if you continue the journey with faith and perseverance, someday you WILL be a good preacher!"